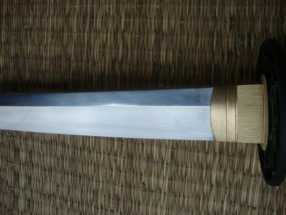 The standard Ronin Katana has a 28" blade (measured from the tsuba) - this one adds an additional inch, which may not sound like much but it feels much more 'right' for practitioners over 5'11" or so..
Like all the fittings of these swords, the tsuba is solid iron and a direct copy of an actual edo era antique. 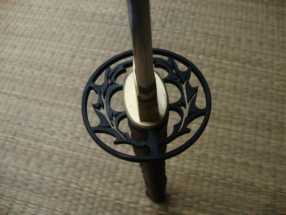 But not only is the tsuba iron - so is the fuchi (band at the top of the handle) AND the kashira (end cap) – all acting in harmony to strongly reinforce the structural integrity of the entire handle in a way that is almost never seen on other swords under the $500 price point (nevermind on swords under $300!). The tsuka/handle assembly itself is exceptionally tight and well put together, double pegged with silk ito wrapped over REAL blackened rayskin, wrapped in a traditional alternating style to ensure it does not loosen with use and tightly bound to a quality wooden core. As you can see from the picture, these swords feature high end brass seppa (spacers) and habaki (blade collar), and the saya is strengthened with rich chocolate brown buffalo horn caps (Kurikata, Koguchi and Kojiri) with a red under-sheen that appears in direct sunlight. The black lacquered saya (sheath) itself is made from high quality wood and can be tied to your obi (belt) by hard wearing, dark brown synthetic sageo cord. 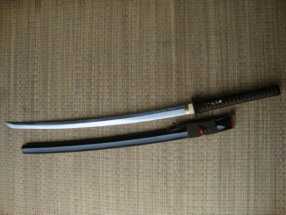 I love this sword. 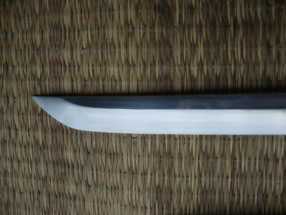 It is solid without tons of decorative features on a functional blade. The brown silk handles well without signs of wearing. 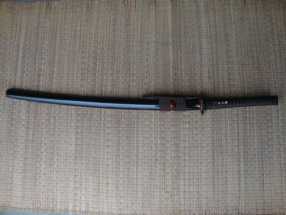 Extremely well balanced, this is a great katana to start with. I liked the briar theme and the beautiful sheath as well. 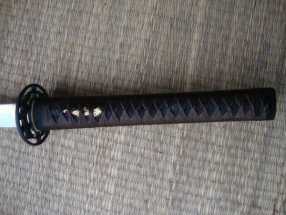 I have had this sword for several years and purchased through the SBG.